Okay, we know we said ‘chic’, and maybe neon orange lights and giant spiders aren’t exactly chic, but if you are having guests over for Halloween, this is sure to make an impression as soon as they walk in. Your hallway is also probably the only room all those trick or treaters are going to see (hopefully), so best go all out. Paper decorations make for the perfect Halloween decorations because they are inexpensive and look super effective. 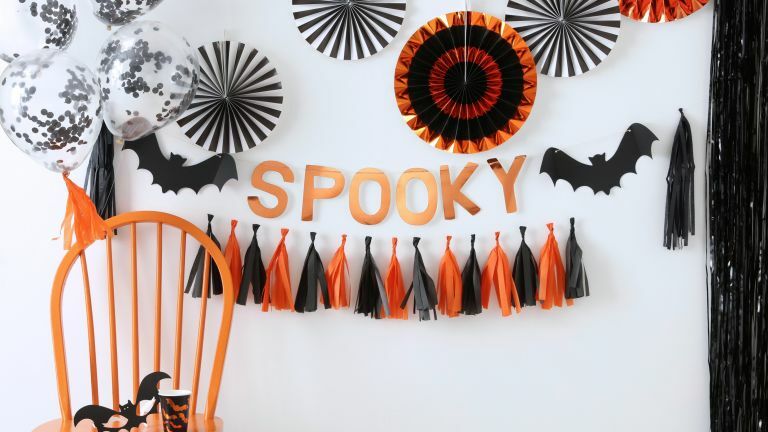 Hang up this spooky glittering bunting along with plenty of pinwheel decorations and that’s your party get up sorted. Or, for a more subtle look, string up this rather chic pumpkin garland to give your mantelpieces a Halloween update. For a stylishly spooky soiree, set the scene with dark and dramatic tableware. Start with a simple black table cloth and build up from there – an ornate candelabra as a centrepiece, plastic spiders dotted around the cutlery and you can even pick up a scarily realistic raven to complete the look. Along with the decoration, Halloween is also of course all about the sweets, so why not combine the two? It’s a long lived tradition to use food as decor at Halloween – pastries that look like fingers, cookies that look like spider webs, etc, etc. Try out this idea and fill up Kilner jars with sweet treats for some super easy homemade Halloween decorations. Just make sure the sweets in some way resemble either a pumpkin or a body part and you’ve got yourself some really easy decorations. Or try out this really simple idea, use a baking bowl covered in spider webs to store all your sweet treats. Halloween decor never looked more tasteful. Turn your kitchen shelving into a cabinet of curiosities by adding just a few spooky ornaments. You can pick up these sorts of ghoulish goodies everywhere this year, from Wilkos to George Home, and you can either dot your shelves with real tiny pumpkins or fake the look with artificial ones. We love this idea from @crazywonderfulblog , so simple but so effective. Just use a stencil to cut out some black bat shapes and artfully arrange them up the wall. Got to be the easiest and most affordable homemade Halloween decorations ever. This obsession with a wreath for every season is definitely an American trend that’s seeping over the pond, and we are completely okay with it. Homesense is the go to place for Halloweeny, autumnal (sorry fall) wreaths but Not on the High Street and Wayfair also have some good offerings this year. Take it even further than just a wreath and go all out haunted house. Well, haunted house/autumnal dream house. And while we can only dream that our front doors will ever look like this, you can definitely pinch some ideas. Try recreating this look on your own porch by grouping together different sized pumpkins, hurricane lanterns and outdoor fairy lights. Who says that trees are just for Christmas? Create a really easy DIY Halloween tree (yes, that’s now a thing) by covering some twigs with black spray paint and decorating with some spooky baubles. John Lewis and Partners have an amazing selection of Halloween decorations this year, including a pre-lit Halloween tree if you don’t fancy getting crafty. Real or plastic, you can’t go wrong with dotting your home with a few glowing pumpkins to add a festive feel. And it’s not just about carved pumpkins either. Paint them, decoupage them, dip them in glitter or just keep them au naturel. Anything goes.